Monday - Friday .... 10 a.m. to 4 p.m.
Saturday ................. 10 a.m. to 1 p.m.
​West Coast Internet, (949) 487-3302, ​http://westcoastinternet.com/. ​The links on the left side are to read your emails on line. The PC Workshop is a facility where Laguna Woods Village residents can use a computer and get help on basic questions. There are more than thirty (30) well-maintained computers with current operating systems, basic office suite software, and a broadband connection to the Internet. Additionally, some machines are equipped with scanners and digital imaging software. 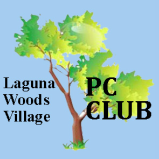 The PC Workshop is open six days a week and is always staffed with Laguna Woods Village PC Club volunteer Supervisors and Greeters to welcome and help users. On October 6, 2004, both the PC Workshop and the Learning Center were switched over to high-speed Internet access via the Laguna Woods Village Broadband cable system. Please Note: Volunteer members make every effort to maintain all computers in good working order for your convenience. Since these computers are used by a large number of people, some user guidelines have been established to help keep the PCs operational. Please take a moment to review these guidelines, and if you have any questions, please contact one of the Supervisors at the Workshop. ​ready to be picked up by their rightful owner.